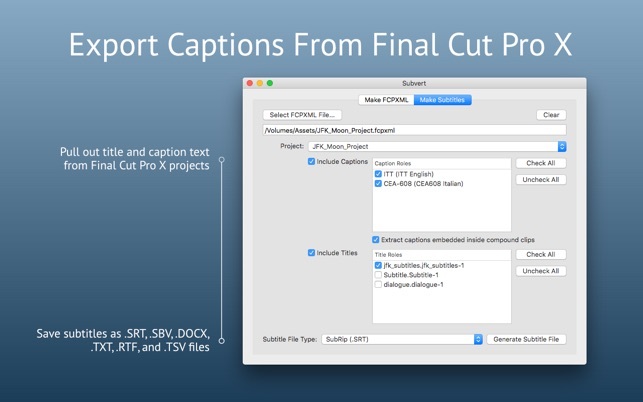 Subvert makes editing with transcripts and captioned source footage easy in Final Cut Pro X. It's perfect for speeding up documentary and foreign-language video post-production workflows. 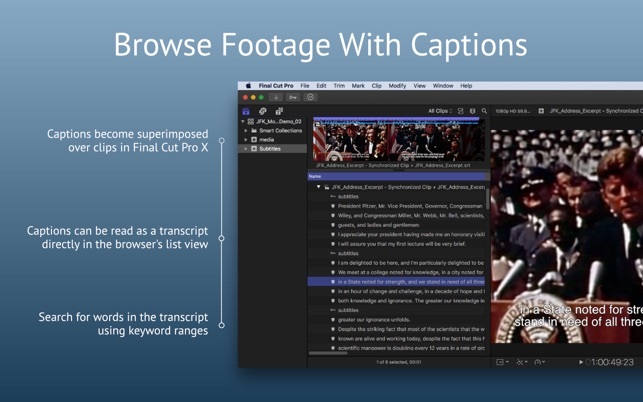 Subvert expands on Final Cut Pro X's captioning capabilities. Use it to add captions to your source footage and simplify editing with foreign language footage. Embed markers so you can read the transcript right in the browser. 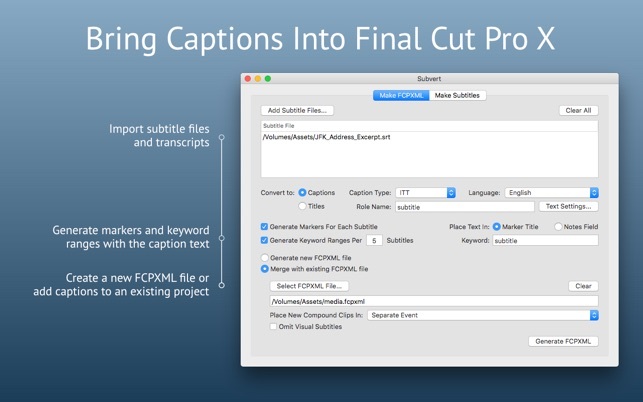 Or use it to convert an FCPXML of your finished project into a subtitle file for final delivery. Subvert provides a robust end-to-end subtitling workflow. 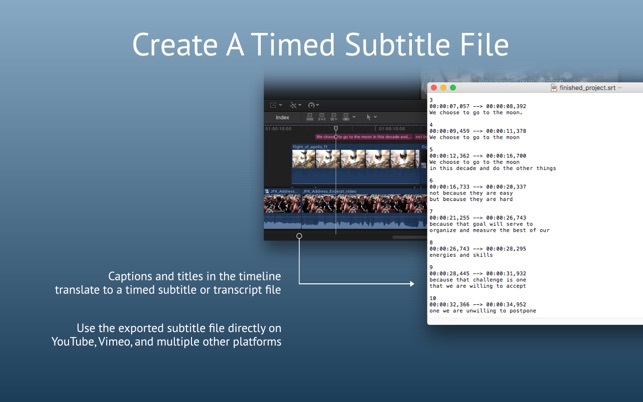 • Watch subtitles over source video footage from the browser in real-time — After processing your subtitle and FCPXML files in Subvert, your footage clips will transform into compound clips containing captions or titles. Titles will appear over your footage as you watch it in Final Cut Pro X's viewer. • Read as a transcript and search for words in the browser — Enable markers and keywords in Subvert so you can read and search the transcript text right in Final Cut Pro X’s browser. 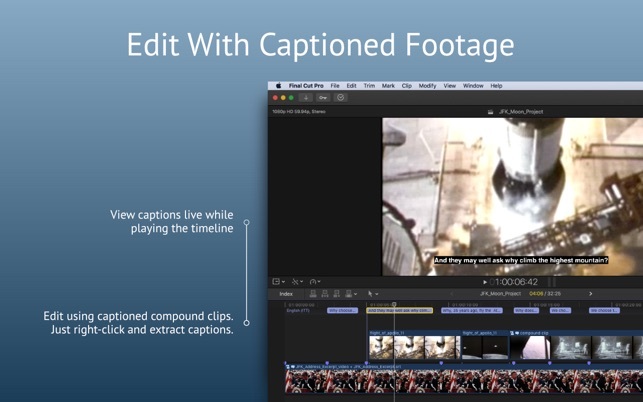 • Edit captions — Since you're working with compound clips, you can edit the captions to fix errors or adjust the text. The changes you make will propagate to all instances of that clip across all projects. • Bring captioned clips into your timeline — Once you edit a compound clip onto the timeline, you can extract its captions to show them in your project. Right click the clip and select "Extract Captions." • Export subtitle files from your project — After your project is finished, export an FCPXML and bring that into Subvert. The app will detect the captions (or any title with a specified role) and create a properly timed subtitle file for final delivery from the edited project. • Reads multiple file formats — Subvert can import SRT, SBV, Avid DS, and regular transcript files in plain text and MS Word formats. • Add markers and keywords — Captions can be integrated into Final Cut Pro X as markers and keyword ranges, allowing you to read transcripts straight in the browser list view and search for specific words inside lengthy dialogue. • Customize caption appearance — Change the font, size and style of the caption laid over your video. Optionally reformat line breaks to fit the width of the screen better. • Export finished subtitle files — When you’re done editing, use Subvert to convert an FCPXML of your edited project back into a subtitle file. Then you’ll have instant subtitles for your finished video without transcribing again. SRT, SBV, TSV, and plain text files are supported. • FCPXML files must be formatted as FCPXML v1.6 or greater. Importing subtitles as captions instead of titles is only supported starting from FCPXML v1.8. • Added a default “Titles” role in the Make Subtitles pane to allow the user to select titles that don’t have a custom role name. • Added support for Dark Mode. Misadvertised caption and subtitle converter. I cant believe I wasted money on something that many online tools provided for free. I thought this interfaced with FCPX and allowed caption and subtitle creation within FCPX but it does nothing in addition to what FCPX offers out of the box. "Browse footage with captions" and "Edit with Captioned Footage" as two screenshots say, this is standard in FCPX and the app has no interface or functionaluty with this. It is just a glorifed misadvertised caption and subtitle converter. Essential for my workflow, producing media with FCPx. There’s a bunch of subtitling apps, but I’ve found this to be a straighforward and flexible tool, better than most. The developer is really helpful too. We have been using this tool for a while to convert back and forth between FCPXML and SRT with great results. Highly recommended!